GeoOrbital has put a new spin on the conventional bicycle wheel. 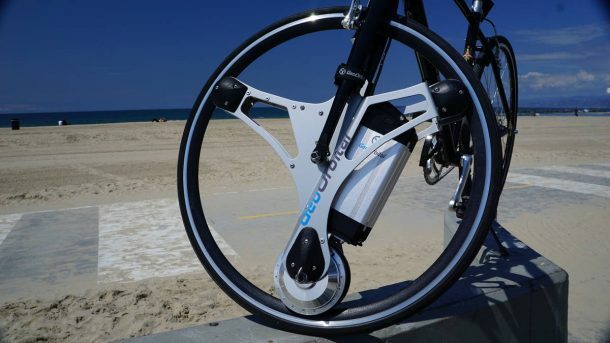 It is essentially a battery-powered tire that can conveniently be swapped for the original ordinary wheel in your bike. The inventors of GeoOrbital had previously been exposed to cutting-edge technological advancements in the transportation domain. Having dabbled in the production of spacecraft at SpaceX and an EV at Ford, the trio hit upon the idea of GeoOrbital. The genius of GeoOrbital lies in the fact that it does not require the users to invest in a new bike. 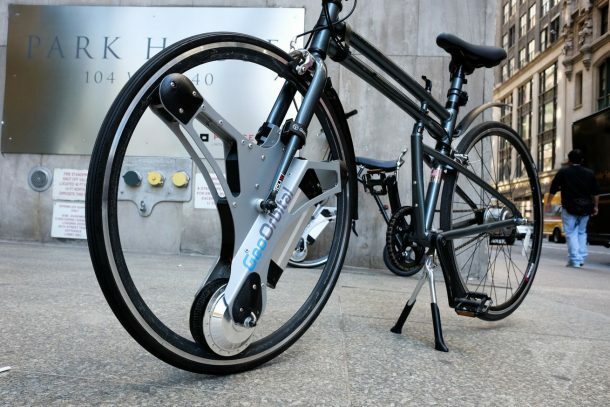 In fact, the electric wheel amps up your ordinary bike in a mere 60 seconds. Replacing the front wheel of your bicycle, GeoOrbital enhances your cycling experience with its 26 inches tire. The exclusive design of the tire flaunts a flat-proof, foam tire whereby you can forgo the hassle of dealing with the flat tires. The device is powered by a removable Panasonic Li-ion battery rated 36V. The battery can last up to 20 miles, without assistance, and can go as far as 50 miles with pedaling. The device is equipped with a USB port to charge phones and other devices on the go.